I buy shrimp at the supermarket (Publix) -I don't know what kind it is, but is says "previously frozen". The intestines, on the top have been removed, but there is a nerve underneath that, if not removed, I can feel with my tongue when I eat it. When I eat shrimp at restaurants, I never notice the nerve at the bottom. I remove the nerve for just my husband and me, but it would be to tedious to remove if I were entertaining. Why doesn't restaurant shrimp have this nerve? What is the secret? The common terms for those are "sand vein" for the digestive tract on the back and "blood vein" for the nerve tract on the bottom. The blood vein usually is only a problem with very large shrimp and sometimes not even then. If it's visible, it can be removed by getting the tip of a knife blade under it. If you buy shrimp with the heads on, with practice, you can pull the heads off (not cut) and take the veins out with it. This is very much a personal thing. Obviously, those of use who peel our own boiled shrimp don't worry about the veins. Nor do those of us who are able to get them so fresh as to eat them virtually alive. I mostly get fresh brown Gulf shrimp in Large size and remove only the sand vein, along with the shell. A slick little tool splits the shell and gets the vein. Check on where the shrimp is sourced. Here "previously frozen" means Chinese or Thai or Vietnamese. Which is dicey, sanitation-wise. IMO look for fresh shrimp! 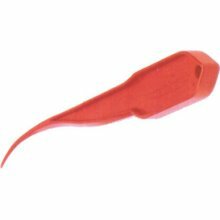 A slick little tool splits the shell and gets the vein.